Over the holidays, I found myself depleting my stock of cheese as I brought various small wheels to share with family and friends. In order to focus more on quality and consistency, I am only making small rounds from 1 gallon of milk. This gives me the flexibility to take accurate notes and track my progress, without a huge expense for failure. Now that the new year has come and gone, it is time to get ready for the Holidays! Cheese making is not a patient hobby as it takes a a few months to enjoy the fruits of your labor. Add in the steps and aging required for a traditional cheddar and you can extend that even further. So with that in mind, I thought it the prefect opportunity to start again. I go to the Farmer’s Market for my milk as it is the best way to get a fresh and local product. There are raw milk clubs that I have utilized on occasion, but it wasn’t available for today. 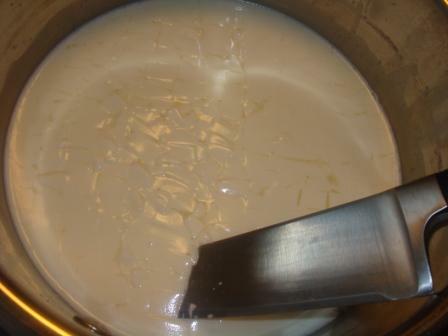 After bringing the milk up to temp and adding the culture (I use a direct set mesophilic starter), I added liquid animal rennet and waited to cut the curd. After waiting for the appropriate amount of time, I got the clean break that you are looking for. 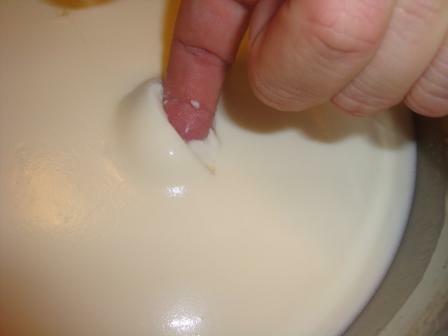 As you can see from the photo to the left, the curd separates with a distinct edge to the break as opposed to something somewhat runny. The amount of time to achieve this can vary depending on the milk, the rennet, or a variety of other factors. 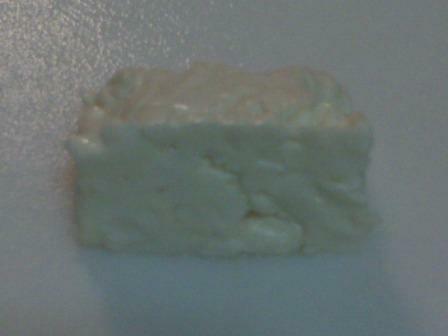 I cut the curd into quarter inch cubes using my knife. 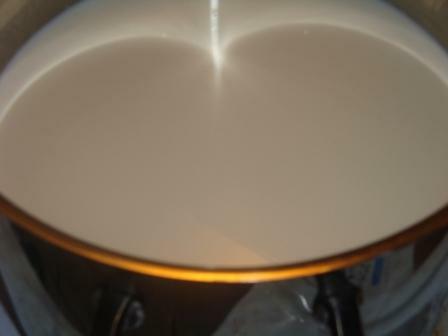 This process is what starts further separation between the curds and the whey. One of the main ideas behind this process is to concentrate the proteins and fat solids of the milk into the tasty product that we all know and love. I brought the curds up to temperature (100°) and continued to stir and agitate the curds to expel as much whey as possible. Once the curds have been maintained at the appropriate temperature for a approximately 30 minutes, I let the curd rest in the whey for an additional 20 minutes, and then drained the curds into a cheese cloth colander and let them sit for 15 minutes. It was now time to cut this mass of curd into blocks and start the actual cheddaring process. Here is a picture, albeit one with very poor lighting and quality, of a cheddar plank. Cheddar is actually a verb. You “cheddar” by stacking your curd planks on top of each other in order to continue to release whey and generate acid production. After turning and re-stacking for approximately 2 hours, the planks have dried to where they have the texture of dried chicken breast. the planks are then broken up into small pieces, salted, and then placed into the press. 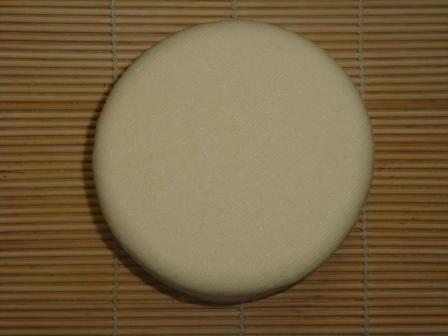 After several pressings at increasingly heavier weights, I was able to get a good curd knit and a smooth finish. I will air dry for 3-5 days before waxing and placing in my cave. Oh my goodness. You make it look so EASY! I am absolutely desperate to try this.